We’ve heard your growing excitement in anticipation of the pre-release of Lahn. Now the time has finally arrived for you to take control of the battlefield like never before with aerial acrobatics and fast-paced combat introduced with the Lahn Class. ◈ In order to alleviate the more complicated steps necessary in transporting items in Storage to other towns or territories, the following transport routes have been added or amended. ◈ You can now use the World and Server chats in Balenos and Serendia territories without consuming Megaphone items or Energy when equipped with Crown items. • In the other territories, you can also use the World and Server chats without consuming Megaphone items or Energy. ◈ Lahn Level-up Challenges (Y) have been added. • During the event period, level up your Lahn and claim awesome rewards via Challenges (Y). 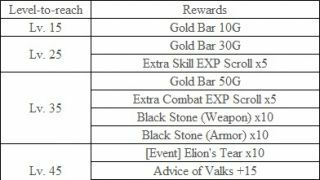 ◈ ‘Loyal’ and ‘Valks’ Attendance Rewards revamped! • Loyal Attendance Rewards will offer the [Event] Lost Penguin in this revamped period. 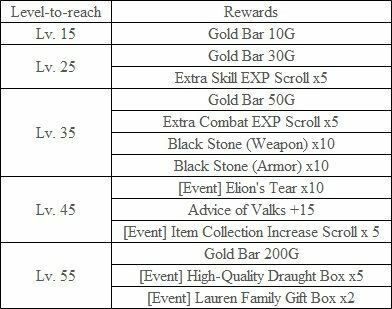 • Valks Attendance Rewards have returned upon popular demand. 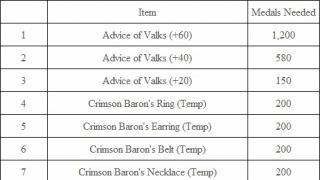 Don’t miss this chance to stack up on Advice of Valks item! • Click <Here	> to find out more in detail! ◈ Sound effects have been added and revised for when UI is activated. ◈ Some of the areas near Calpheon castle and Valencia castle have been changed so that forts and command posts for Conquest war can no longer be built. ◈ Prerequisite requirement of switching to the Awakening weapon in order to learn an Absolute skill has been removed. ◈ It has been adjusted that character will be immune to Grapple for 5 sec. after being released from it. 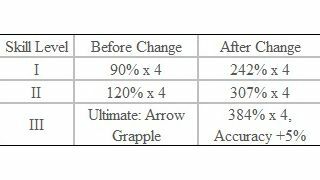 ◈ To prevent continuous Grapple from being possible, the timing of when CC count for Grapple is applied has been changed. ◈ Fixed the issue where additional HP recovery was not being applied intermittently when inflicted hit from a Grapple skill. 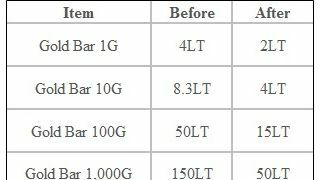 ◈ Recovery rate of Black Spirit’s Rage when receiving hit has been modified. • There is a 10% chance of recovering 1% Black Spirit’s Rage when you are hit (the same for PvP and PvE). • Now there is a 100% chance of recovering Black Spirit’s Rage when you kill other Character. ◈ Black Spirit’s Rage Absorption (Common) has been added (Hotkey: Z). 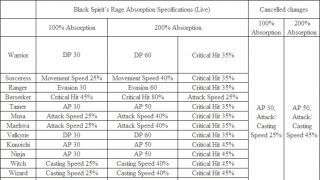 • Previous Black Spirit’s Rage Absorption has become a special skill and the newly-added Rage Absorption (Special) will increase Attack/Casting Speed and AP upon activation. • Press Hotkey: Z in order to activate Black Spirit’s Rage Absorption by locking either the common or special skill. • By default it is set as Black Spirit’s Rage Absorption (Common). 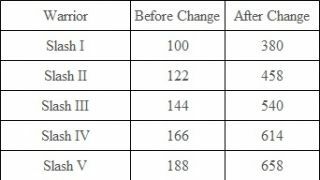 ◈ Extra Hit Damage for the skill Will of the Wind III has been changed as the damage ratio inflicted was lower compared to other levels. 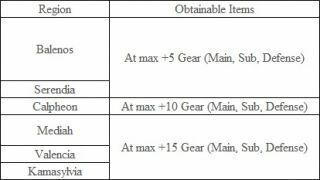 ◈ The text stating Damage reduction will be applied during cooldown during PvE only has been added to the skill description of the skill Absolute: Will of the Wind. ◈ Moving distance of the skill Shake Off will now be affected by Moving Speed instead of the previous Attack Speed. 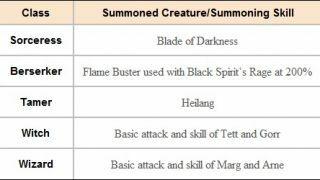 ◈ The skill Heilang: Surging Tide will be activated in combo for Heilang Lv.1 now. ◈ When consuming 200% of Black Spirit’s Rage to use the skill Shining Dash, Super Armor will be applied during hits. ◈ Fixed the issue where MP recovered was higher than as stated in the skill description for the Detonative Flow upon a successful hit. ◈ Fixed the issue where the skill Detonative Flow could not apply damage on Forts and Annexes during Node/Conquest Wars. 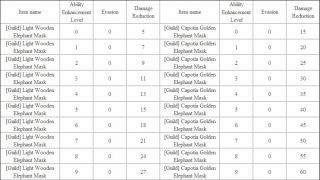 ◈ Fixed the issue where you could not damage enemies, besides monsters and other adventurers, with the following skills. ◈ Fixed the issue where the skill Chase was being repetitively activated when there was not enough Stamina. ◈ Fixed the graphical glitch in the cloth of the leg part and the gem part of the belt for Maehwa with the Rakshande outfit on. ◈ Fixed the issue where the last hit was not applying proper damage upon using the skill Lethal Spin Spree consuming 200% Black Spirit’s Rage. ◈ Stiffness effect on the last hit has been removed upon using the skill Lethal Spin Spree consuming 200% Black Spirit’s Rage. ◈ PVP damage has decreased by 15% upon using the skill Lethal Spin Spree consuming 200% Black Spirit’s Rage. ◈ Fixed the issue where the external appearance of a basic helmet was being displayed instead upon equipping Serendian Soldier outfit. ◈ Fixed the graphical issue where the bottom part of the outfit seemed to penetrate through the body of the character in certain motions. 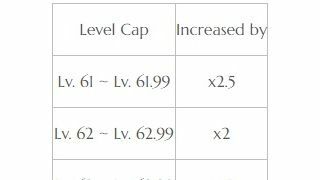 ◈ Description about Super Armor effect has been removed from the skill description of the skill Rising Wolf Fang. ◈ Fixed the graphical glitch in the gem part of the belt for Mystic with the Rakshande outfit on. ◈ Fixed the graphical glitch in the Canape Shoes when having it equipped together with Banha outfit. ◈ A new type of seeds, “Magical” seeds, have been added. • If you are Farming Artisan 1 or up, you can get Magical seeds by Farming Special seed/hypha using Plant Breeding. 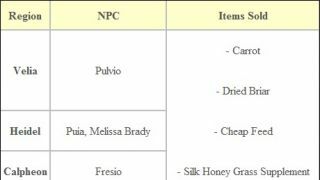 • To use Harvest or Plant Breeding on crop grown from Magical seeds, your character must be Farming Artisan 1 or up. • Magical seeds take up 5 times the usual amount of grid space, but give 5 times the amount of harvest in return. • You only get Fruits from using Plant Breeding on crop grown from Mysterious seeds, but you will get Magical seeds from using Plant Breeding on crop grown from Magical seeds, with a certain chance to also get Fruits. ◈ A new formula to gain Mysterious Seeds and Mysterious Hyphae through Shaking -	> Processing (L) using Magical Seeds and Magical Hyphae has been added. 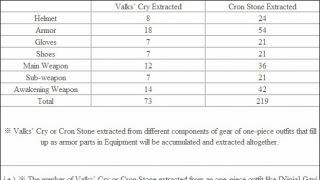 • This formula has been added to the item description of the Mysterious Seed items. ◈ Description regarding 100% Enhancement Chance has been added to the item description of General’s Accessories and Fierce Fighting Spirit Stone. 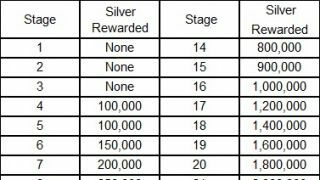 ◈ Description regarding tier of the horse has been added to the Challenges (Y) reward ‘Horse Emblem: Lv. 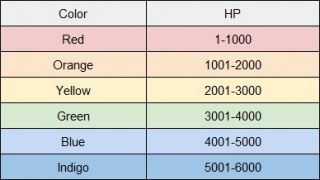 40 Reward’ which could be earned for reaching Lv.40. ◈ For details on newly added Pearl Shop Update, please click < Here > (soon available) ! 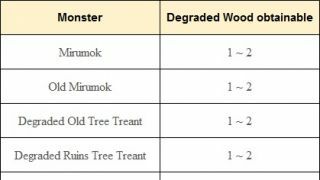 ◈ New pool of monsters has been added to Mirumok Ruins and placements of some of the monsters have been changed. ◈ Fixed the awkward movement of the Goblin Fighters and Goblin Throwers near Ehwaz Hill. ◈ Suggested quest names displayed in the Quests window (Hotkey: o) has been edited to show more detailed information. 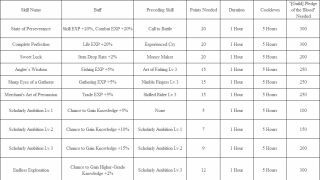 • Rewards obtainable for completing the quests have been added. 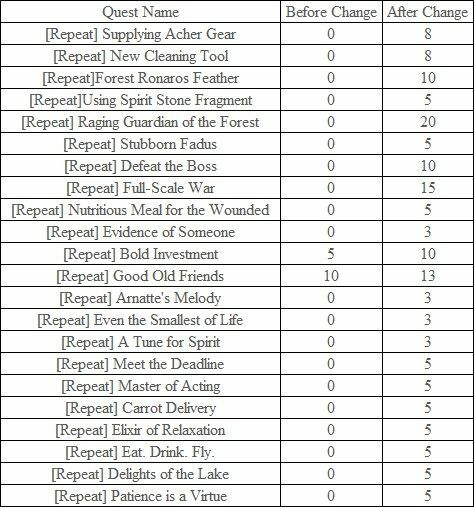 • You can mouse over the each quest list to see the full text. 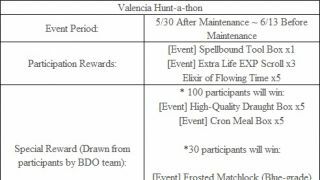 ◈ Contribution point restriction has been removed from the acceptance condition of the daily quests available in Valencia City. ◈ Amended the awkward text in the quest summary of [Ninja] Narusawa's Sura Katana - Practice. 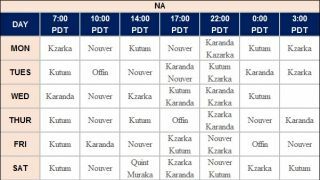 ◈ Conversation has been added with Shady Tree Forest Node Manager Arteedman so that the node can be discovered if Shady Tree Forest node cannot be obtained through the regular route. ◈ Gold Key will now be exchangeable through a quest and not through conversation with Morco. 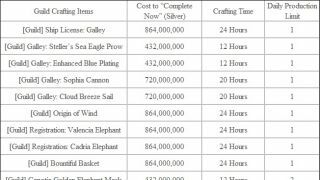 • At least 1 Silver Key must be in the Inventory (I) in order for you to accept the quest. ◈ Fixed the issue where item quantity in other region’s storage list appeared intermittently as 0 when interacting with a Storage NPC to open storage. ◈ Fixed the issue where the skill Fury Transfer could not be locked. 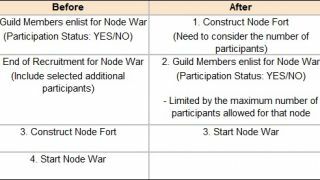 ◈ Fixed the issue where characters located in node war areas could not move to the Forts of the affiliated guild intermittently at the start of the node war. ◈ Fixed the issue where the castle gate lever could be damaged and destroyed by the attack of Summoned creatures during Conquest War. ◈ Fixed the issue where Renown Score was not updated in real time when the equipped gear was destroyed or repaired. 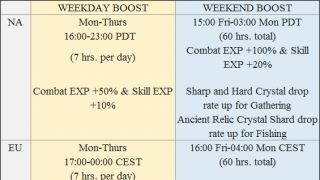 ◈ We are aware that Floating effect is not being applied properly for the skill Soaring Kick of the Tamer and this will be fixed in the next regular maintenance. 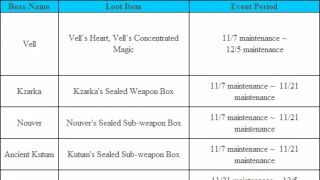 ◈ We are aware of the text issue for the item description of [Lahn] Orchid Fall Classic Set where Awakening Weapon is mentioned to be included in the classic set. This is a text issue and will be fixed shortly. Please be aware the [Lahn] Orchid Fall Classic Set does not contain an Awakening Weapon.